Today is National Poultry Day, so what better time to share a delicious chicken recipe!These chicken tenders use Mila® chia for a light and crispy crust. Mila is a versatile ingredient in cooking and baking. It is high in fiber and omega-3s, it’s gluten-free, trans-fat free, sugar-free, and a superior plant-based source of protein. 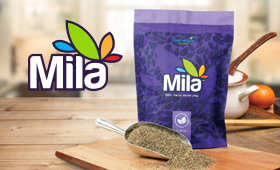 Mila uses different varieties of chia seed to provide a wide array of nutrients. By combining these crops, you get a nutritionally robust product. Mila contains the omega-3 fat ALA, or “alpha-linolenic acid.” ALA has been shown to support heart health; in fact, studies have shown improved cardiovascular health among those with a high intake of ALA- containing foods. Heat oven to 400 degrees. Coat chicken tenders with almond meal, salt and pepper. In a bowl, whisk the eggs. Pour Mila into another bowl. Dip each tender in egg, then Mila. Bake for 10-15 minutes, or until chicken is baked through. Chia seeds are prized for their ability to provide sustainable energy and have been a food staple in both the Mayan and Aztec cultures, along with native tribes of North America. In fact, chia is the ancient Mayan word for strength. Mila also helps meet the fiber needs of your family. The fiber found in Mila is predominantly insoluble fiber, a form of fiber that aids in the relief of occasional constipation. Is a whole, raw super food and a natural source of omega-3s, antioxidants, and phytonutrients. Is a blend of different crops of chia seed to help maximize nutrient density. Contains 3 grams of protein. Contains other important nutrients such as calcium. May be a great vegetarian substitute for fish oil. Mila can supplement your diet with plant-based fiber and protein. Can be consumed on its own or incorporated into your favorite dishes, yogurt, and smoothies. Mila® can replace eggs or up to ¼ cup of oil in recipes. May be a great addition to your pet’s diet. I can’t think of a better day to share chili recipes than on National Chili Day! I’m talking about the hearty, comforting, meaty and veggie kind of chili! It’s still the perfect time of the year to warm up with a big bowl just packed with a unique combination of ingredients, including products by PURE. I think these are definitely cold-weather worthy and I hope you’ll agree. Grab your ingredients and get cooking! Make one of these, or both, and have your friends and family choose their favorite! This is a delicious, hearty chili with a very subtle chocolate flavor, but a lot of tang. You can add jalapenos to this recipe if you desire more of a kick. The additional of Matcha Vegan Shake adds omega fatty acids and all essential amino acids for sustained energy, Also, naturally occurring tryptophan in sacha inchi helps serotonin production for elevated mood. Matcha naturally supports fat metabolism and aids in healthy digestion and cleansing. In a large Dutch oven over medium-high heat, add the ground beef and cook for two minutes until browned. Next, add the onions, chili powder and cumin and stir together. Add the Matcha Vegan Shake (Dark Chocolate) and garlic, mix together and cook for two minutes. Next, add in the ranch-style beans, cayenne pepper and oregano and cook for another minute. Add the black beans, diced tomatoes, tomato sauce and broth, cover and simmer for one hour, stirring occasionally. This is a delicious, vegetarian chili that uses chia. Mila is a super food that is gluten-free, trans-fat free, sugar-free, and is a superior plant-based source of protein and fiber. Mila uses different varieties of micro-sliced chia that is easily digestible and nutritionally robust. In a large pot on medium heat, cook garlic, onion, chili powder and hot sauce. Add chopped tomatoes, crushed tomatoes, chick peas, red kidney beans and black beans. Allow vegetables to cook. Add cilantro and Mila. Stir. Slowly add spinach. Cover and let simmer on low heat for at least an hour. Find more recipes at livepure.com/recipes. Have a favorite recipe that incorporates products by PURE? Share it with us at stories@livepure.com. If you are just starting out with your PURE business, you’re probably asking yourself, how am I going to learn everything I need to know about the products and opportunity so I can share them with customers? It may seem like a daunting task, but you don’t have to be an expert. Conversely, if you’ve been with PURE, you know how important it is to be prepared to answer questions, and you know where to seek out answers you may not have. 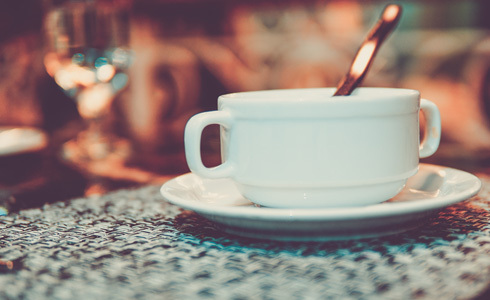 It’s difficult to share products with a customer if you know nothing about them and if you don’t know how that product will address his or her specific needs. The key is knowing your customer’s needs and understanding how the product can benefit them. For example, a benefit of PURE Perk is that it provides mental focus within just minutes. * If you know someone at work who has trouble staying focused, they might benefit from this fantastic product. Listen carefully to your customer and understand what they’re looking to gain from a product. You would not want to share Metabolic ONE with someone who has a goal of putting on additional weight. It wouldn’t make sense. Here are some common scenarios. For each, we’ve listed the tools and/or resources that will help them find more information about PURE. Your friend’s 8-year-old daughter hates eating vegetables. Show her the Product Overview Guide at livepure.com so she can become educated about our products, or you can send her directly to learn about Greens, a good source of antioxidant-rich fruits and greens. Here she will find the product description, recommended usage and ingredients. You can also show her where to find recipes using Greens. Your sister was just laid off from her job. Introduce her to the PURE opportunity by sharing the PURE Prosperity Compensation Plan video. Send her to livepure.com so she can browse. Introduce her to PURE’s Facebook page to meet the community. Your brother is competing in a half marathon and is looking for natural supplementation to decrease his time. Give him a GPS Playbook so he can learn all about the GPS performance line of products. Use the GPS sampling sleeves to introduce GPS Energize or GPS Hydrate. You have a new IBO on your team who has nutrition questions you can’t answer. Show them the Ask the Expert forum where they can submit their questions and receive answers within 24 hours. Make sure they know how to use their Back Office to find product education. They can also find articles about nutrition on PURE’s corporate blog. Education is important, but what about the delivery of your message? It’s imperative that you are a product of the product. That means that you regularly use the product so you can speak to its benefits, usage, and any other relevant topics a customer may want to know. If you personally use the products, your confidence will show, and you will be enthusiastic to share them with others. Enthusiasm will come naturally when you love the products. When you’re enthusiastic, you’ll remove any uncertainty your prospects may have. If they believe in you, they will believe in the product. It’s essential to be brief, too. Keep your benefit list short and choose the most impactful ones to share. Too much information at once can be initially overwhelming. If a customer has an objection to a product, it’s probably because you may have recommended the wrong product for their specific need or they want to learn more about why that product is the best solution for them. Share with them the product’s value, how it should and can be used, and other products by PURE that it can be taken with. Keep in mind you don’t have to have all those details memorized, but become familiar with the available tools, above, so you know how to quickly seek out answers to best support your customers questions. Other ways to become educated are to regularly engage with your upline, which is the person who sponsored you. Keep a list handy of testimonials about a product to share. Your own personal use of the product is super powerful. Remember that your customers crave product knowledge. It’s how they make their decisions, and it’s how they know they can trust you. So, they need to feel that you have their best interests at heart. Meet the noni, a large, light-colored fruit that grows in tropical climates, and was traditionally used as a food, an herbal remedy and nourishing tonic in the Polynesian islands. It is also a key ingredient in one of our Superfruits at PURE. Noni is deemed “super” when it comes to your health, and we are about to share why. Polynesians ate noni fruit as a stimulant and as a way to combat fatigue and promote endurance.1 The fruit has been used for centuries as herbal and folk medicine in Indonesia, Hawaii, Australia and other tropical islands. The warm climate and nutrient-rich soil of the tropics guarantee perfect growing conditions for the noni fruit. Noni Superfruit by PURE uses 100% pure morinda citrifolia, the tree noni comes from. It is not diluted with other juices, and is kosher, gluten-free and vegan. 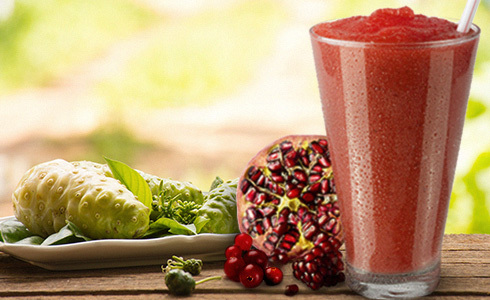 Our formulation uses no additives or fillers so your body is benefiting from the whole fruit. If you are averse to the strong taste of noni, you might want to try the following recipe for a sweet tasting and nutritious smoothie. Add liquid ingredients to a blender followed by avocado and then the remaining ingredients. Add a bit of cayenne for a flavorful kick or stevia to enhance the sweetness. Order Noni today and reap the benefits. Baby, it’s cold outside! No wonder that January was designated National Soup Month. We have a delicious soup recipe to warm up your stomachs, and hearts. It incorporates Mila® micro-sliced chia as an ingredient, so you know it’s healthy! Mila is a super food that is gluten-free, trans-fat free, sugar-free, and is a superior plant-based source of protein and fiber. Mila uses different varieties of the chia seed to provide a wide array of nutrients. By combining these crops, you get a nutritionally robust product. Enjoy this pureed soup while getting your daily serving of Mila and increase your intake of leafy greens and other nutritious whole foods. This soup is rich in fiber, vitamins and minerals, not to mention flavor! In a bowl, place Mila in 1 cup of vegetable stock to hydrate. Set aside. Using a tall frying pan or wide-bottom pan, sauté chopped onion in olive oil until translucent (3-5 minutes). Add garlic to pan if preferred. Add remaining 3 cups of vegetable stock, chopped greens, thyme, cumin, lemon juice, and quinoa to pan; bring to a boil. Reduce heat to medium; cook until quinoa is translucent and greens are wilted (8-12 minutes). Add soup and hydrated Mila (including the remaining vegetable stock) to a blender and puree until smooth. This flavorful soup can also be made into a hearty dip or spread by reducing the vegetable stock used to boil the greens by 1 ½ cups. Find more recipes like this at http://livepure.com/recipes. Do you have a favorite recipe to share? Submit it here.